A woman who took part in the toppling of a Confederate statue in Durham has been arrested and slapped with felony charges, cops said Tuesday. 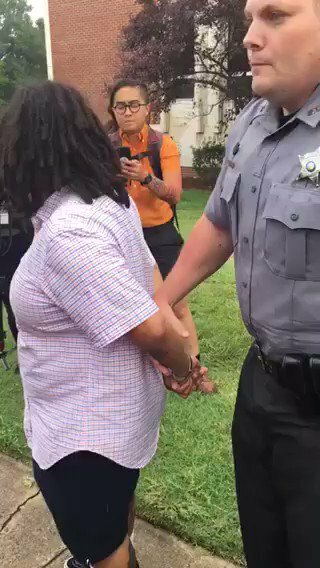 Takiya Thompson, 22, has been charged with disorderly conduct by injury to a statue, damage to real property, participation in a riot with property damage in excess of $1,500 — and inciting others to riot where there is property damage in excess of $1,500, according to the Durham County Sheriff’s Office. The last two offenses are Class H and Class F felonies, with each carrying a sentence of up to 25 months and 41 months behind bars, respectively. 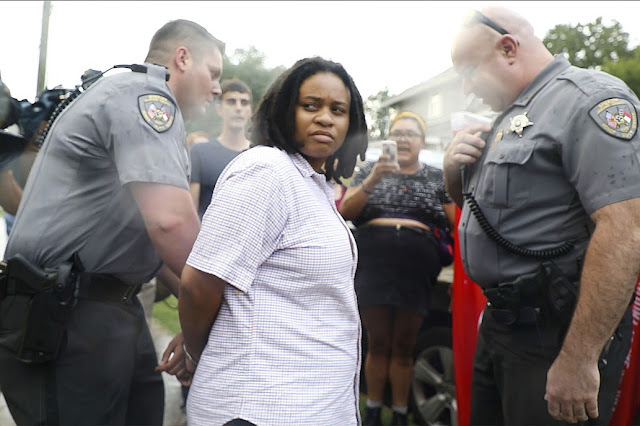 Deputies took Thompson, a member of the far-left Workers World Party and a student at N.C. Central University, into custody Tuesday shortly after she appeared at a press conference with other protesters. Investigators said Thompson confessed to climbing the monument and aiding in its removal after being identified through cellphone video. Authorities have been are using the footage, which was captured by cops, to identify all of those responsible and bring them to justice. “The Sheriff’s Office is executing search warrants and additional arrests are expected,” officials said in a press release. Breaking: Takiyah Thompson, who climbed the Confederate statue in #Durham in solidarity w #Charlotteville was arrested. Drop the charges! The group behind Monday’s statue stunt has called on the Durham County Commissioners, the Durham Sheriff’s office and District Attorney’s office to drop the charges against Thompson — while also urging the City of Charlottesville to drop charges against anti-racist protesters that were arrested there last weekend during the deadly “Unite the Right” demonstrations. Thompson was allegedly caught on camera Monday climbing a ladder, tying a rope around the statue’s neck and helping the crowd pull it down — all while cops stood by and did nothing. Sheriff Andrews insisted Tuesday that even though it seemed like authorities weren’t initially bothered by the incident, they’d be prosecuting the protesters to the fullest extent of the law.